The time to choose a new director-general for the UN cultural organisation UNESCO is coming soon. This is a very important decision, and I would like to explain to the world why it is so important that this position should be given to an Arab, and specifically to an Egyptian candidate, in this case Moushira Khattab. France has also put forward a candidate for the directorship of UNESCO. It is true that the organisation is based in Paris and that the French are wonderful collaborators in the field of cultural heritage. I can speak from personal knowledge in this regard, since there are many French expeditions currently excavating in Egypt, and the archaeological cooperation between our two countries is superb. The Franco-Egyptian expedition to the temples at Karnak is an excellent example of international cooperation, with archaeologists from both countries working together to record and preserve these spectacular monuments. There have also been many great French scholars who have contributed to Egyptology, from Mariette Pasha, who founded Egypt’s antiquities service, to Champollion, who cracked the hieroglyphic code, and including Maspero, Lauer, Leclant and many others. Although the French government values this cooperation, it seems to have chosen to overlook the fact that Egypt has put forward a highly qualified candidate for the directorship of UNESCO and has proposed a candidate of its own. The authorities in Egypt have written a letter to the government in Paris to ask that the French candidate be withdrawn. 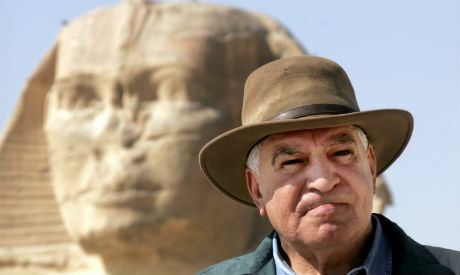 Some have even proposed that the Ministry of Antiquities stop all archaeological cooperation between France and Egypt in protest at the French move to support a rival candidate. A group of these protesters went to meet Khaled El-Enany, the minister of antiquities, to ask him to cut off relations. I myself do not want this to happen, and I hope that the French will find a way forward for which all of us, as Egyptians and Arabs, can be grateful. The French candidacy is against the long-held and established practices of UNESCO, which do not support a nominee from the headquarters country. Nor do these practices allow a country to hold the position of the organisation’s director-general more than once. The principle of rotation must be honoured. Since UNESCO’s inception in 1946, an Arab country has never held the directorship of the organisation, and it is time that this took place. In Egypt, we are now celebrating the 200th anniversary of the discovery of the Great Temple of Ramses II at Abu Simbel, and El-Enany travelled to Paris to attend the festivities surrounding this event. These very temples, along with many others, were saved through the actions of the international community. It was UNESCO, at Egypt’s request, which managed the salvage campaign that preserved so much of the heritage of ancient Nubia, threatened by the building of the High Dam at Aswan in the 1960s. The importance of Egypt’s cultural heritage to the world is only one reason why we deserve to have our candidate chosen as the next director-general of UNESCO. The Arab candidate for UNESCO, Khattab, truly deserves this position. She is an exceptional person and is extremely well-qualified for the post. She will be able to serve in an honest and professional way, and she is the right person to lead the organisation during these difficult times. But Khattab is not just an Arab candidate. She represents Africa as well. She received the full support of African leaders at the summit meetings in Kigali in 2016 and Addis Ababa in 2017. The African Union promotes her candidacy as an African nominee who is well aware of the continent’s priorities and concerns and the one best positioned to serve African interests at UNESCO. Khattab is thus a candidate who represents the Arab, Islamic and African cultures. Throughout her life, Khattab has demonstrated her dedication to cultural heritage. She is truly an international candidate as her career spans the United States, Europe, Australia and Africa. She has a PhD in human rights law and has held important diplomatic positions, including as Egyptian ambassador to the Czech Republic and to South Africa. I have met her over the years in many of her posts, and wherever she has gone she has been active and has won the love of people in every city she has lived in. She has also made great contributions as secretary-general of Egypt’s National Council for Childhood and Motherhood. I was her colleague during the appointment of a new government after the 25 January Revolution, when she was made minister of state for the family and population. Her contributions to cabinet discussions were always impressive, and they showed her capabilities and integrity. She will be a great representative of Arab women, and indeed of all women and all people. Khattab believes that the right to quality education is the single most effective strategy for the realisation of all other human rights, and she has always fought to put her beliefs into practice. She has great international experience, including multilateral and bilateral experiences with various UN organisations as well as serving her country during events of historical significance. Her background shows that she has the necessary passion and can lead UNESCO successfully. Anyone who reads the presentation she gave to the relevant UNESCO committee will recognise that she has the vision required to push this organisation to help solve the problem of education in Third World countries and save the world’s cultural heritage, notably in those countries where this is being destroyed by terrorists. This article was first published in Al-Ahram Weekly.